Chatham Square is a great place to start your Chinatown explorations, because so many key streets flow into it and are just steps away, including Worth Street, which takes you to Columbus Park; Mott Street, one of Chinatown's main streets; the historic and uniquely shaped Doyers Street; and East Broadway, home of a large Fujianese community and lined with street markets and dining bargains. StoryCorp's Sole NYC StoryBooth is in nearby Foley Square. Site of the Kim Lau Memorial Arch erected in 1962 in memory of fighter pilot Benjamin Ralph Kim Lau, the first reported casualty, and the Chinese Americans who died in WWII. 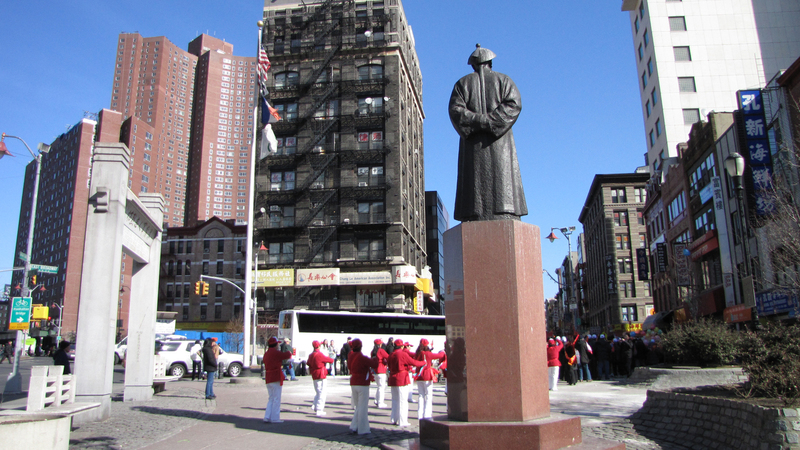 A statue of Lin Ze Xu, a 19th-Century Ching Dynasty anti-drug enforcer who ignited the Opium War is also on Chatham Square. East of the Square, on Division St, is Confucius Plaza, where a statue of Confucius stands near the tallest building in Chinatown.